Ruth writes: We expected that the first few days after the Aga Khan Museum’s opening on September 18 would draw big crowds. The museum is in Toronto; we figured there would be plenty of time to see it later without competing with others. When we finally got ourselves organized, we discovered that its opening exhibition was due to close in a few days. In preparation for a quick visit, I went to the museum’s website. I don’t know about you, but I don’t absorb much while I stand up in a museum and try to read descriptions of relics. The web-site is wonderful. It is full of pictures of individual pieces from the collection with a lot of description. Seated at a computer is comfortable and remembering the information is easier. I made notes of items I especially wanted to see. We went on a week day morning. From the parking lot, the north side of the building is austere and forbidding. It reminded me of walled cities I had seen in Asia. I liked the look of the Ismaili Centre next door better. It is largely glass and more inviting. A visit to the Centre will have to wait for another time. The Aga Khan is the spiritual head of Ismaili Muslims. Few people were in the museum. The interior was welcoming and palatial. 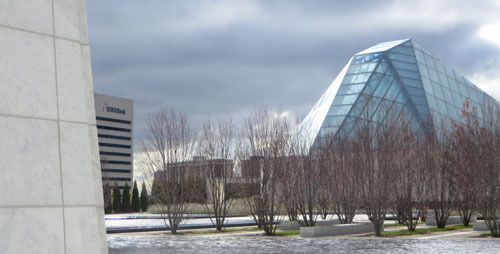 The open-roofed courtyard has 13 meter-high glass walls. It brought in the sunlight and made interesting shadows on the walls. The building was apparently designed to impress and it does. The staff invited us to see the Bellerive Room. It and much of the ground floor can be explored for free. 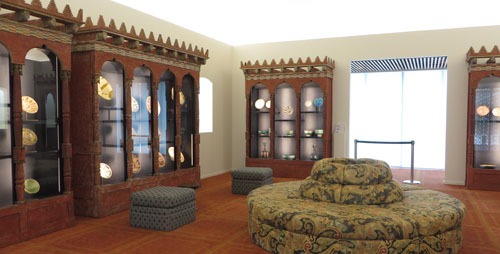 The Bellerive Room holds the ceramic collection of the late Prince Sadruddin Aga Khan. The Persian Salon in his Geneva residence inspired the decor of this gallery. Its glass cases with their Moorish arches, its Persian carpets, comfortable chairs and a home-like feeling made me think I was a privileged guest. It is old-world money. I expected a butler to bring some tea and sweets at any moment. Some of the ceramics were from 12th century Neyshabur in Iran. We were allowed to take pictures in the ground floor gallery for our own use, not for a blog. Nearby was a video of a blue ceramic tile. The plants on it appeared to be alive and growing. Cute! Do look for it. Near the coffee shop I found an amazing hanging, one side in a Persian-carpet design, the other side vibrant red. It was made in Pakistan in 2014 out of 1,200,000 gold pins. It’s 5.49 meters long and fascinating. I could find no mention of it in the museum’s literature. This too was free to see and you might over-look it unless you search for it. The ground floor also housed the current exhibition. At that time it was “In Search of the Artist” with signed drawings and paintings. We needed to buy a ticket to see it and the permanent collection on the second floor. The sixty pictures were from the 16th and 17th centuries, from famous artists in Iran, India and Central Asia. I didn’t know any of the “famous artists”; I’ve never studied West Asian art though I’ve been in museums in the area. I did remember some of the pictures from the website. When I found them, it was like finding an old friend. 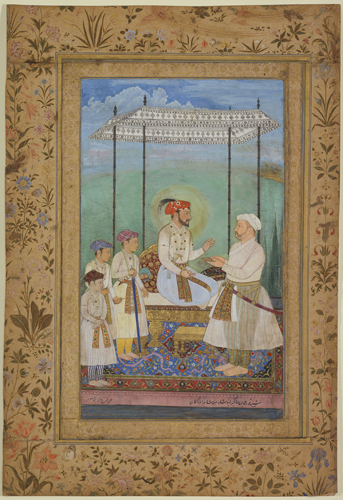 Shah Jahan, His Sons and Asaf Khan. Probably Agra, India. ca 1628. 35.5 X 35.3 cm. AKM124. Courtesy Aga Khan Museum. In this exhibition, many of the works were tiny and were of groups or individuals. The pictures are beautiful, their lines very fine. Some were painted with a brush made from one squirrel’s hair. I looked for a larger copy of the images that would show the details but I couldn’t see any. It would have helped to have some terms like “khamsa” defined. I wondered about the depiction of humans and animals in Islamic art. It seems that secular art has often had no problems with it. It is forbidden in religious Muslim art, the second of the 10 Commandments. I have always loved these miniatures of ancient rulers and everyday scenes, and the highly decorated picture frames and manuscripts. 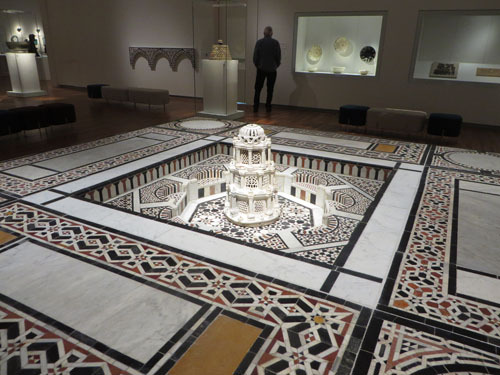 I also love inlaid stones in white marble and sandstone mosaic. I didn’t expect to find a life-sized fountain in this gallery. It’s from a 15th century home in Egypt, used for cooling the air. The museum does not allow photography in its permanent collection, even for personal use. You will have to see it for yourself or on-line. Alam or Processional Standard. From Iran or India 16th century. Pierced steel. 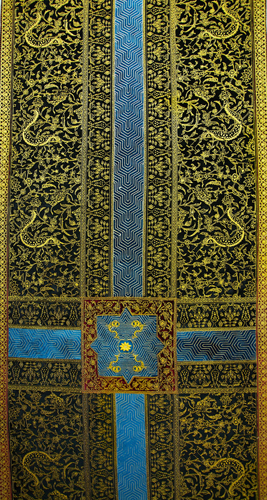 82 X 32.5 cm. AKM679. 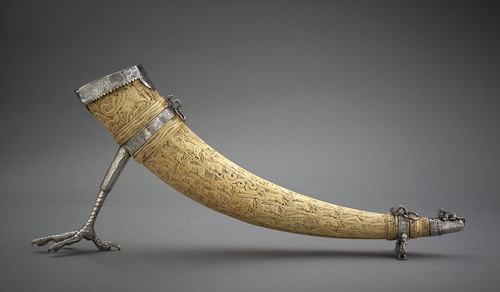 Image courtesy Aga Khan Museum. 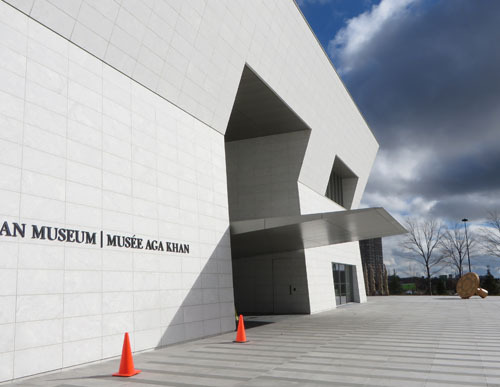 When we left, I was grateful that the Aga Khan decided to put his $300 million museum in Toronto. I was so impressed I wanted to return to see the next temporary exhibition which goes from December 13 to March 15. It’s a collection of relics found in an Arab ship wreck off the Indonesian coast. The dhow was on its way west from Tang dynasty China. I’m determined to take a guided tour next time. It’s an additional $5-$10. The general admission is $15-$20. Tile Panel. Central Asia. 14th Century. Earthenware, carved & glazed. 56 X 39 cm. AKM572. 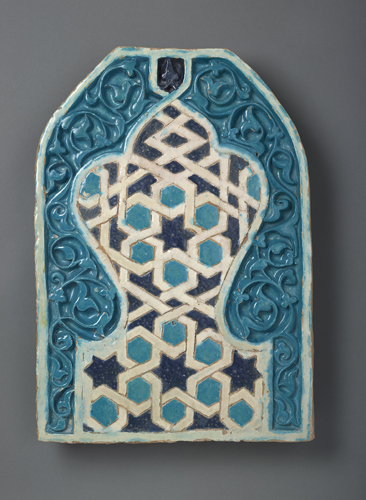 Image courtesy Aga Khan Museum. The museum also has lectures and musical performances. It is on 77 Wynford Drive near the Japanese Canadian Culture Centre and not far from the Science Centre. The parking was abundant. It’s not as convenient by TTC but a bus stops outside its door. 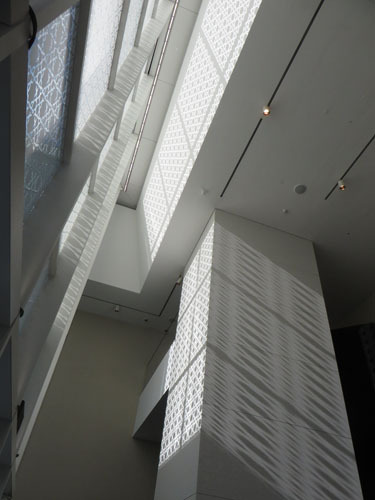 The website is: www.agakhanmuseum.org. If you go, tell us about how you felt about it. Email us at ruthlormalloy@gmail.com. That’s one very impressive museum, Ruth! I really like the shadows on the walls produced by the light through the windows, nice. 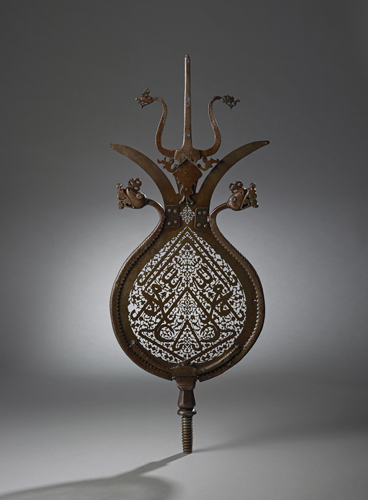 These gorgeous items of Islamic art are all ancient. Were there any modern art pieces on display? Ruth, wonderful blog site and post – thank you! i have just subscribed, and look forward to future posts.